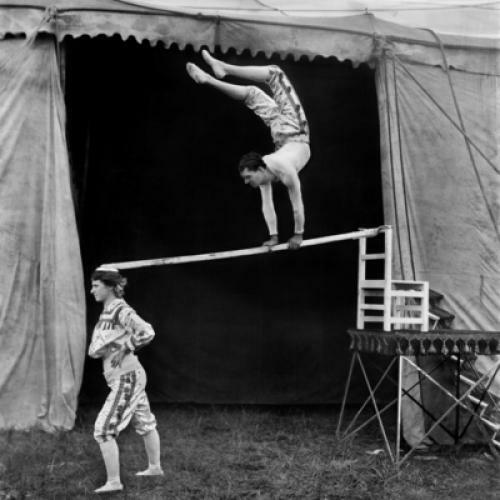 For more than 150 years, from the early nineteenth century deep into the twentieth century, the circus was grand popular entertainment. Practically as soon as you took your seat in the arena you were in the grip of an experience that can almost certainly not be recaptured at the circus in our own day, no matter how wonderfully executed the individual acts happen to be. The circus of yore was a fantasy kingdom, a desperately needed refuge from the gathering sobriety of industrial society, with its chilly regimentations and rationalizations. The clowns and the acrobats who made their living under the big top embodied some of the most ancient and even primitive powers of the theater. When their artistry was at its peak they came close to resurrecting a lost classical world, where slender female athletes had beguiled Cretan royalty and masked funnymen had kept the Romans convulsing with laughter. In Europe and America, a public that ranged from the proletarian to the posh was mesmerized by the circus’s mix of thrill, joke, and ritual. Avant-garde artists and writers were addicted, along with everybody else. The circus, for all its glitz and even its glamour, was entertainment with an old soul, a respite from the fast-forward pace of modern life. For certain artists—especially Picasso, Rilke, and Rouault—the clowns and the acrobats acquired an almost religious aura: they were the only people whose lives any longer embodied a true spirituality. To run off and join the circus, that jokey cliché, was not only to abandon family and friends but also to escape modernity itself—to become a dreamer, a vagabond, to live outside of time. The power of the circus to establish a time outside of time fascinated filmmakers as well, especially Ophuls and Fellini. The dream and the reality of the circus in its heyday are the subject of the remarkable photographs that Frederick W. Glasier took in the first quarter of the twentieth century. This material is certainly not well known among curators and collectors, although the photographer Jerry Uelsmann had already made some prints from Glasier’s glass-plate negatives in 1965. Glasier’s photographs, many of the Barnum and Bailey Circus and the Sparks Circus, bring a quotidian clear-headedness to this incandescent subject matter. Sometimes he photographs circus performers one at a time, infusing his portraits with a tender objectivity. Sometimes he pulls the camera back to tell a little story, photographing an acrobat in the middle of his act or the crowd watching the circus as it comes into town, parading down Main Street. His work adds unexpected details and perspectives to the already extraordinary trove of imagery and iconography we know from circus posters and photographs of the period, and from the work of Daumier, Degas, Toulouse-Lautrec, Sickert, Rouault, Luks, Kuhn, Beckmann, Picasso, Calder, Léger, and Matisse. Glasier, like a number of late nineteenth- and early twentieth-century photographers, exerts a fascination while remaining something of an enigma, so far as his intentions were concerned. Although we know that Glasier was a professional photographer in Massachusetts, the combination of commercial and personal factors that powered his engagement with the circus is probably impossible to disentangle. Perhaps he saw no conflict. The survival of these photographs—as Peter Kayafas, himself a photographer with a sure feeling for the quotidian, explains in his introduction to Circus—was by no means a forgone conclusion. After Glasier died, his widow sold the glass negatives, and they were eventually acquired by the John and Mabel Ringling Museum in Sarasota, an art museum with a distinguished collection of paintings and a mandate to document the history of the circus. Both Kayafas and Luc Sante, who contributed an essay to the book, see parallels between Glasier and such legendary contemporaries as Eugène Atget and August Sander. These are photographers who used documentary strategies to achieve poetic ends. If there is a connection between Atget and Sander and Glasier, it has everything to do with the mysterious power of the view camera and the glass-plate negatives which such cameras produced. For Atget and Sander, the deliberation that was built into the photographic process turned the camera into a mediumistic force, an all-seeing and perhaps all-knowing eye. In the hands of the right photographer, the technology had the paradoxical ability to absorb not only facts but also fancies, not only the way a person looked but also the way a person dreamed, so that the subject’s psychological complexities were lodged deep in the image, although we cannot say how or why. The more I look at Glasier’s photographs, the more their power grows. This is not an artist with a signature style, and that may be part of his fascination. Perhaps Glasier did not care to have a style, except in so far as attentiveness is itself a style. His dispassionateness only underscores his affection for his subjects. I feel very strongly his bond with acrobats, clowns, and circus workers of all kinds, many of whom must have been friends to some degree, considering that he most likely traveled for periods of time with one circus or another. Glasier probably photographed his subjects exactly as they wanted to be photographed, with their illusions intact and only a little bit of private passion showing through—the part that the camera could not help but reveal. There are several portraits in this collection that may well come to be recognized as classics of early twentieth-century photography. A 1902 portrait of an anonymous clown, with a triangular tear painted beneath each of his eyes and a tiny, pointy-topped hat sitting aslant his head, brings a beautifully stripped-down honesty to old conventions of theatrical melancholy. And a photograph of another clown, Pete Mardo, in full regalia, dancing out-of-doors with his attractive, smiling wife Florence, combines intimacy and ebullience. The playful mood is underscored by a backdrop of slightly out-of-focus tents topped with flags flapping in the breeze. You can almost imagine Pete and Florence sneaking off into one of those tents for an hour of love. Glasier explored every aspect of the circus. He photographed Buffalo Bill’s Wild West show, and the sharpshooters and Native Americans who were among the entertainers. He photographed a tent-raising, a ticket wagon, an elephant receiving a pedicure, a concession stand selling drinks, a circus train cook, an African American sideshow band, a drum corps, an equestrienne hanging out her laundry to dry, and the performers on line to receive their paychecks. We feel here—as in the work devoted to the circus by Picasso, Calder, and Rouault—that we are getting the lowdown on a society within the larger society. We begin to understand the dynamics of what amounts to a small town, with its routines and its networks of love and friendship. We see the nitty-gritty of this peripatetic fantasy kingdom, the civilian moments in the lives of men and women who became a part of American mythology, legendary for their comic bravura and their athletic derring-do. And all of this takes place on the flat, dusty, utterly ordinary edges of America’s growing cities, in the open spaces where new factories and residential neighborhoods will soon appear. When Prince Youturkey, known as the Japanese Wonder, performs his high-wire act, it is not under the big tent but out of doors, with the acrobat silhouetted against a cloudy sky. Circus: The Photographs of Frederick W. Glasier is one of the most beautiful art books of recent years. The reproductions—large and lucid and presented one by one, on the right-hand page of each double-page spread—draw us into the intricacies of Glasier’s world. This book makes the strongest possible case for Glasier as a major figure in early twentieth-century photography, an artist who can stand in the company of Atget and Sander, and also Ernest Bellocq, whose photographs of New Orleans brothels created a sensation more than a generation ago. No organization is better situated to make the case for Frederick Glasier than the Eakins Press Foundation, which since its founding in the 1960s has published some of the classic volumes on American art and photography, including Lee Friedlander’s The American Monument, Walker Evans’s Message from the Interior, and Lincoln Kirstein’s definitive monograph on Elie Nadelman, which is not only one of the most beautiful art books ever produced but also a masterpiece of American prose. It is more than a decade since the death of Leslie Katz, the founder of the Eakins Press Foundation, and Circus demonstrates the continuing importance of the work that the foundation is doing, now under the confident leadership of Peter Kayafas. Katz named his organization after Thomas Eakins, and the Eakins Press has always been true to the great Philadelphia painter’s mingling of poetry and candor. With this extraordinary volume, the Eakins Press continues its invaluable explorations of the American imagination, once again bringing an exacting modern eye to the interpretation of this country’s romantic spirit.